Do you fill out surveys online? Do you take surveys for cash? Do you like to get paid for filling out internet surveys by PayPal? Do you like to get paid for filling out surveys by check? Do you like the idea of making money from home or wherever you log onto the internet in your spare time? I have been doing surveys long enough to have seen many low quality sites, been rejected from surveys, paid to join a site and been ripped off, done surveys to never get paid for them etc. I still love surveys though and I decided to help other people to navigate beyond the bad sites to the promised land. The sites below are all free to join and use. Most offer some bonus money just to register. Most offer payment through PayPal, the best type in my opinion. But most importantly of all, I have joined, used and successfully cashed out with all of them. So I know they are for real and can confidently promote them to you. Look through the list and choose a few. Register, confirm and fill out the profile sections to qualify yourself for surveys. Then take some time to get to know the sites. Take the surveys you are interested in or invited to. Decline the surveys you don’t think are worth the time or seem boring. Quit the sites you do not enjoy and sign up for a new one in its place. Stay active and find your groove. Bookmark or favorite this list. Follow this blog for more great tips and insights on how to make extra income online. Do this for yourself. Do this for your loved ones. Do this to better your financial situation and spend your time online constructively. And most importantly, have fun! If you get through this list and still want more choices, be sure to check out even more great free sites to earn online. They are giving a $5 bonus for spending $25 in their shop-and-earn area. What are the best groups to advertise on Facebook? Also be sure to check out my list of five more free sites to generate income online. Online earnings reports have always generated interest. When first hearing that one could make money online from home, it leads to many questions. Is this true? How on earth is this possible? Wow could I do this too? Yes you can. Online earnings reports have always generated interest. When first hearing that one could make money online from home, it leads to many questions. Is this true? How on earth is this possible? Wow could I do this too? Years ago I asked myself these same questions. The search for answers began immediately! It started out with much pain. Wasted hours of work, scams and dead ends. Slowly but surely I would find something that worked. One of the first things that actually paid me was taking online surveys. I will detail what sites and how much I’ve actually made a little later on in the post. Many of the flashiest sites out there, promising huge payouts with minimal effort, well, they are usually too good to be true. This was a painful lesson to learn and almost made me quit trying to take surveys for money online. But like with anything else online, applying the 25/75 rule helped to turn it around and make it successful for me. What is the 25/75 rule? Spend 25% of your online time learning all about your niche, goal, skill, approach you want to use to make money online. Then spend 75% of your time implementing and perfecting what you’ve learned. If you follow this formula, results will come and continually get better. So following this rule I started coming across great resources, like one site called Survey Police. To my delight, I found this was a great review site. Anyone who has joined and used a paid survey site can leave a review and tell us all how their experience went. Most of the big survey sites are represented here, along with details of how each site operates. Armed with this new information, any time I came across a new site that I might join I opened up the Survey Police review and checked out what people had to say, good or bad. I dodged a few stinkers that way. Over time and with other tricks and tips that got discovered, I found that it was possible to male a few hundred dollars a month in my spare time online. Seeing the money come in, still a trickle, led to more time spent and a refocus on how much was being made per hour. At one point a couple of years ago I calculated that I was able to make up to $12 an hour just from taking surveys. I had developed a legitimate pipeline for making decent money on the side from home with nothing more than a laptop or phone. How much have I made? Well I have used many sites over the years. Some have gone out of business, some changed their format, some are as strong as ever. I have included earnings for five sites in this post though I have earned from many more. All of the included sites have direct referral programs. That means, if I refer you to join the site and you make money on the site, I earn a commission. So I only want to tell you about sites that you will earn money using. Otherwise what a waste of time this would be. Here is the earnings report as of the published date of this post. Five free sites that have paid me over $2000. InstaGC – I have earned $811.89 from this site. PaidViewpoint – I have earned $446.71 from this site. Branded Surveys – I have earned $439.29 from this site. Swagbucks – I have made $287.29 from this site. Keep in mind that I am still using all these sites and the totals continue to increase daily. If you want to make some extra money from using these free survey sites, click their names above to register and get started. This will never cost you anything, no credit card number, no fees, no paid upgrades, ever. Are there any weaknesses to this tactic of using paid survey sites to make some extra dough in your spare time? sure. Some say they dont get paid enough to be worth their time. Some say they get disqualified often from surveys after answering many questions. Some say that the site will never actually pay you, it’s just a number somewhere on an anonymous website. While I have found all these complaints to be perfectly true, I have also found that the ‘bad’ sites give the good ones a terrible reputation. I too felt this way about survey sites when I was chasing the shiny objects and had not learned how to successfully navigate these waters. There are many advantages to taking surveys on your computer or phone to earn some side income. You get to do it when you want. Whether it’s 6AM before anyone else has gotten out of bed on a Saturday, or 8PM on a Tuesday night after we put the kids to bed, or during a Netflix binge of Tidying Up or Property Hunters I can make some money with a few easy clicks. We want to thank you for reading this post, and sincerely hope that you will find this earnings report to help you in your search for online income. Please leave your comments below with your own favorite survey sites or experiences with the five we shared. Do you have something to share with the world? It can be very frustrating when you know there are so many people out there that might be interested. But how do you get it in front of their eyes? That is the first key to online marketing. You need what is called traffic. What are some forms of traffic? Well there are Facebook pages and groups. There are other social media and sharing platforms like Pinterest, Reddit, Twitter, Digg and Exchangle. You could start a free blog on WordPress or Tumblr or Blogger. There is search engine traffic. No matter what you are trying to share, if no one sees it there is no point in sharing it. We are here to help. We are inviting everyone to comment on this post with your link or offer. Include a website if you have one. There is no charge for this, nothing is expected in return. Why should you post your link in the comments here? Well consider that hundreds of people will read this post every week. That is quite a few potential customers. Also if you have a website or blog, dropping your link here helps your SEO score and can get you more organic search results. The whole point is to get noticed. The more active you are online the more the search engines value your content. Comment here with your link and your pitch. Like other comments and reply to them. We will promote this post and get lots of attention on your links. Follow this blog to get lots of great marketing, money making, blogging tips. Make money today just by registering with these survey sites! All you need is a valid email. In many cases you can sign up using your existing Facebook account. Earn over $30 today to sign up and confirm your details. How can survey sites pay you just to sign up to their site? Well this industry is very competitive. There are many survey sites fighting for users on their platform. So to lure new people to their site they are willing to pay you a bonus! A simple law of supply and demand that you need to take advantage of today to earn some of the easiest money you can find online. Swagbucks – get a $10 registration bonus. Eligible countries include the US, UK, Canada, Germany, France, Australia and Ireland. Inbox Dollars – get $5 to register. Members wanted in the US. Point Club – get $5 to register. Members wanted in the US. Fusion Cash – get a $5 bonus just to sign up. Members needed in the US and Canada. Panda – get $3 to register. US members wanted. Cash Crate – $1.50 to register. Worldwide registration. All of these sites are legitimate sources of long term side income. If you sign up to them today you are on your way to some decent extra income from taking surveys online. There is no charge for any of these sites, no fee to sign up. There are no paid versions of these sites where you have fees. No credit card is needed or even asked for. Money only flows one way in this case, from the site to you. Cash out limits vary from site to site. How do you spread the word about your information using Facebook groups? Learn what do do here. How do you spread the word about your opportunity on Facebook? Well we recommend many ways but one important part of your strategy Facebook groups. There are several methods to connect in groups as well. We will discuss these methods and give you a list of groups to join and use. If you have a group to add to the list plese include it in comments. One often overlooked tab in groups is the files tab. If you open it up you can create a file or upload a file to the group. Adding information here is a great way of getting long term exposure. When you open the ‘add doc’ button you will be given a blank slate much like a word document. You are even given the option to include a header picture. Another great way to get eyes on your business is to make videos. These can be uploaded into the discussion or uploaded into the video tab. Videos are more important on Facebook all the time and see more views than text or even photo posts. Be sure to try several takes to get a good polished product to upload. You can always try Facebook live here too if you want to gather a live audience. Of course the most common way to get to a group is to post your offer in the discussion. Use a catchy image or even a video to catch their eyes. Most groups don’t want you to post more than once a day but some do not mind additional posts. When posting to groups there are some things to consider. If you post -here is my link!- a few people will see it on their feeds and maybe a few more when they check the group. If you ask a question or want the viewer to comment this can be a much more effective tool. Because of Facebooks algorithms, every time someone comments on your post it bumps to the top of the feed. When this happens it is a s good as you making a new post. I have seen posts linger at the top of a group for days, garnering hundreds of comments and generating a massive amounts of leads from one post. This is your goal, for the post to ‘go viral’ within the group and get huge exposure. I recommend you do not include your link in every post. Also keep in mind that if you post your link too many times of too fast, Facebook will block you to slow you down. They do not want their platform flooded with free advertisements, which they then consider spam and treat accordingly. Are you ready for the list? We have had success with these ten groups which all have at least ten thousand members. There are so many groups on Facebook, you should discover and join more that are in your niche too. If the group is too big your post will drop down the feed too fast for anyone to see. If the group is too small no one is watching. So there is a sweet spot between ten thousand and fifty thousand that you want to focus on. Here they are, just join and post. Good luck and thanks for reading! Remember to add a group in comments if you want our viewers to join that one as well. Author More Income, Better LifestylePosted on January 27, 2019 Categories facebook training, marketingTags best facebook groups for affiliates, facebook group marketing, how to use facebook groupsLeave a comment on What are the best groups to advertise on Facebook? How can a beginner earn every single day online, guaranteed? So you need to make some money, and you need it now? I hear from people all the time who are currently in a bad situation, for whatever reason they cannot makes ends meet and they are searching for help. This post is for you. So you need to make some money, and you need it now? I hear from people all the time who are currently in a bad situation, for whatever reason they cannot makes ends meet and they are searching for help. This post is for you. Read it and follow the suggested path and you will earn money every single day. Oh, did I mention it is free? All you will require is an internet connection and your time. You are now standing at the top of a mountain called Online Earnings. We are going to make you a little snowball of income and let it roll down. If you want to skip my motivational speeches and pontifications, skip right down to STEP BY STEP and get started. If you’ve never worked online and decide to give it a try, it can be very intimidating. I was in a pinch myself in the spring of 2014. I had a problem, cashflow, and it needed to be solved in a bad way. Two young kids and a wife depending on me. So off I went on a journey online and I’m still going. Day after day, week after week I toiled in front of the screen. I hit many dead ends, wasted lots of time on flashy ideas that promised easy riches. As with most lessons, I learned mine from mistakes. But I kept at it and started figuring it out. Before long I was earning consistently and I will never forget the first $100 day. What a milestone, it felt great. Would you like to get there too? Your first $100 day, your first $1000 month. Imagine them, work at them consistently and they will become reality. Honestly you cWhen I started I did not have a penny to invest in anything. I was ridiculed by those selling things. You cant make money without money, they told me. So I had to start small. One of my favorite sports teams, the Chicago White Sox won the World Series in 2005 by using a strategy called ‘small ball’. They didn’t try to hit home runs. They got base hits over and over and over. Many in the sports world mocked them, until they held the championship trophy. With this memory and determination I charged forward. Starting with all free sites, I earned a few dollars. I learned how to turn a few dollars into a few more, investing in myself and my online endeavors. Dollar by dollar it came together. My snowball rolled and grew. You might be asking yourself – So when is he going to tell me this golden nugget of info? Why is he telling me this info? Who in their right mind follows the White Sox? How can this be free to me? First, soon but remember dear reader that I did give you fair warning to skip my ramblings. Second, I want you to make money. I am an affiliate marketer. I make money when you take action online and make money. I either get commission from you signing up for free offers, or commission from when you actually use the sites to make money. I’m asking you to join these sites, but I need you to make money using them as well. Third, I grew up near Chicago and the Cubs are so cliché. I cheer for the underdog. Last but not least, it is free because these sites have clients. The clients pay them money for information and analysis. The site pay you for your tasks using that money, to complete the assigned contract with their client. You get paid, the site does good business, and the client gets the product it needs. Imagine you deliver pizzas. The customer pays for the pizza, the pizza parlor makes the pizza. You just deliver it and get a cut in the form of delivery fee or tip. You will be this delivery driver of sorts. If that all makes sense and you are still here, it will be worth it. Here are the four sites chosen for you. All four have some things in common. They are well run, reputable companies. They require no money from members like you. No credit card to enter, no upsales, no fees, no money will flow from you to anyone using my method to make this guaranteed money. They all offer members ways to earn without being qualified or passing screening of some sort. If you live in a country that accepts members like the United States then you are a sure winner. Here we go. Step 1 – Follow the links below and join these three sites. It will take a short time to fill out your email and some brief personal info for identification, just like any reputable employer would ask for. Confirm your email and you can get started. When you have done this come back here for the rest of the steps. I’ve included two bonus sites later in case you want to really get going full speed and three is just not enough. VIP Voice – Accepting members from USA, Canada. Ages 13 & up. Join here. Swagbucks – Accepting members from USA, UK, Canada, Australia, Germany, France and Ireland. Ages 13 and up. Join here. Toluna – Accepting members from USA, Australia, UK, New Zealand, China, Hong Kong, Singapore, and Japan. Ages 16 and up. Join here. Step 2 – Start using the sites. They all have terrific tutorials and help sections. Read them. Start with these guaranteed tasks first. VIP Voice – Click on Survey Center. Click Take Survey Now. Complete the survey. Repeat until the site tells you there are no more surveys left. Come back later or tomorrow. I often get a survey where you fill out a food diary for a week and get paid $25. That’s $100 a month for keeping track of what you eat! The surveys and food diary usually takes me about two to three hours a week. Estimate $4 a day earnings. Swagbucks – This site is a goldmine for those who know how to use it. Be sure to daily play SwagIQ trivia, daily poll, spin and win, team challenge, Swago, surveys, watch videos, coupons, daily & monthly bonuses and much more. Take some time to master this site and it will be worth it. Estimate $2 a day earnings. Toluna – This company works with Amazon, CBS, Sony Music, Kelloggs, Heineken, and Expedia among others. Daily polls are guaranteed money and there are quite a few of them. Take some easy surveys, dive as deep as you want. Estimate $1 a day earnings. Step 3 – Cash out to make these earnings real. The sites will show you exactly how. I prefer PayPal payments but an Amazon or Walmart gift card is always handy. Notice that I have shown you $7 a day in easy money. If you stay active and use these sites once a day, your result is about $200 a month in gravy earnings. Step 4 – Enjoy your earnings if you are satisfied. If you do well and want more like I did, then you have some things to leanr. My advise at this point is to spend 25% of your time online seeking out information from blogs, sites, trusted sources. Then spend 75% of your time implementing what you’ve learned. You can take your earnings and invest it in a more serious online business. You can write a blog and use these earnings to pay for the website, marketing tools and training, advertising etc. Step 5 – This is not really a step but four steps seemed a bit short. That’s how easy it is really when you break it down. Now that you have earned your first dollars online the sky is the limit. Please follow this blog, comment on your ideas or opinions here, and remember to have fun and take breaks from the screen! Well I haven’t forgotten, I promised two bonus sites to boost those earnings. Join PaidViewpoint to get daily trait surveys for ten cents each guaranteed as well as other opportunities. Last but not least join Branded Surveys for a daily poll. Its worth five cents day in and day out. This is a dynamic site with a lot going on. These sites can easily have daily earnings above $1 each but not a huge guaranteed income which is why I did not include them in the top three list here. They are two of my favorites to use. This may be a ton of information to take in all at once but give yourself a little time to test out these sites. You may not enjoy this method or think it’s too slow. I understand and there are many pathways to earning online. This is just one easy one that I know how to teach and have used successfully. Follow this blog to keep seeing topics that will help you earn more income, which leads to a better lifestyle. Thanks for reading! Author More Income, Better LifestylePosted on January 24, 2019 Categories free income opportunities, survey sitesTags daily guaranteed income, easy daily income online, easy surveys for cash, how do i make money online1 Comment on How can a beginner earn every single day online, guaranteed? What is the best survey site to earn money online? By giving your opinions, you will be influencing current events. These polls play an important part of newscasts, articles and commentary on current events. Have you heard of Toluna.com? Influence. That’s the one word I would use to describe this site. By giving your opinions, you will be influencing current events. These polls play an important part of newscasts, articles and commentary on current events. You will see references to these polls throughout your day such as “In a recent poll, 55% of Americans are in support of x”. This is from your survey participation! Toluna is an online survey site. Over 21 million people have used this website to answer surveys and test products. If you take surveys for money on your computer, this is a site you are going to want to investigate. All 21 million members can’t be wrong! Toluna is free to use. They offer members paid surveys, polls and in-home product testing. This site uses a point system for rewards that can be converted to PayPal or gift cards. Basically 30 points is equivalent to one penny. So 30,000 points gets you ten dollars worth of rewards. They must have some reason to use this system instead of cash values but in the end it makes no difference. When you redeem your points they do turn into cash. Let’s talk about product testing. This is a great feature of Toluna, since it is mostly a survey site and you rarely find a site that offers in-home testing of new products as well as surveys. Even if I did not take surveys online as a hobby, I would still join and use this feature of the site. Every week or so you can look under the ‘Explore’ tab and click product testing. This will take you to the product testing screen where you can see any active offers and future offers. I try to visit this page often as I do not want to miss any free offers. After using this site for less than two months I actually received one product to test! I enjoyed the product (mine was worth about five dollars) and the best part is that I got paid to use it as well. Of course Toluna’s bread and butter are their surveys. They also offer paid polls every day which I always try to click every day on any site that offers them for the free quick money. On sites that let you search and try any survey that is open like this one does, the more you try the more you will get rejected from. If you are disqualified from a survey in most cases you still get some compensation at Toluna. This is a nice cushion that softens the blow of rejection. Toluna offers a wide variety of surveys that you can take, and they also show you which ones they recommend you try. Only doing the surveys they invite you to should really cut down on you being disqualified. Once you have some surveys and points under your belt, check out the rewards section. This is a straightforward area of the site and most rewards are offered as retailer gift cards. If you want a PayPal deposit or paper check those are available too. Choose from iTunes, Best Buy, Facebook, Redbox and many more for the gift cards. I have always gotten prompt payment from Toluna. I usually get the $20 PayPal deposit and have also tried the $10 iTunes credit. Both were delivered without a hitch. Toluna is overall a very well run site. They have found a good balance between offering many surveys and narrowing it down for people. They are free to join and use, so even if you are just registering for the weekly paid product testing it is worth it. They pay in all the common ways. They have a great reputation in the industry and have been around a long time. Toluna has a sister site as well. They own and run the VIP Voice survey site. They are both owned by The Toluna Group with US headquarters in Dallas and based out of Paris France. Author More Income, Better LifestylePosted on January 23, 2019 Categories free income opportunities, survey sitesTags best free survey site, free survey site, toluna group, what is the best survey siteLeave a comment on What is the best survey site to earn money online? If you have never tried taking surveys online, this is this site to get you started. If you take surveys for money on your computer, this is another site you might want to add to your list of great places to earn rewards. It is well run, has been around for a long time, and has a great reputation. You can earn some serious rewards by signing up and filling out simple surveys. Have you heard of VIP Voice? VIP Voice is an online survey site. When you listen to the news and they say ‘according to a recent survey…’ they are talking about sites like VIP Voice. VIP Voice is free to use. You will never be asked for a credit card or any payment information. You will never be charged any type of fee for earning on the site. They offer members paid surveys and have a unique system to reward members for their contributions. This site uses a point system for rewards that are then used to bid on merchandise or enter sweepstakes. The more surveys you complete, the more you are rewarded for each one. VIP Voice feels different from other survey sites. Several things add to this feeling. The first thing you will notice is that when you log on and click on the big ‘Survey Center’ button, you are taken to a screen that shows your recent activity. There is another button called ‘Take Survey Now’. When you click it one of two things will happen. Either you will be shown details on an available survey including the estimated time to complete and compensation…or told that there is no survey available for you to take. When you first join VIP Voice you will be compensated 50 points for each survey you complete. As you get more completed surveys credited to your account your ranking will move up and eventually the reward for each survey is 200 points. VIP Voice does not always offer cash as a reward. While I normally prefer the green stuff, in this case it is another angle to maximize your earnings. Let me explain. When points are put into your account (instantly upon survey completion) you can do one of two things with them. You can buy sweepstakes entries to win cash or prizes… or bid on items that are up for auction. The items available are constantly changing. 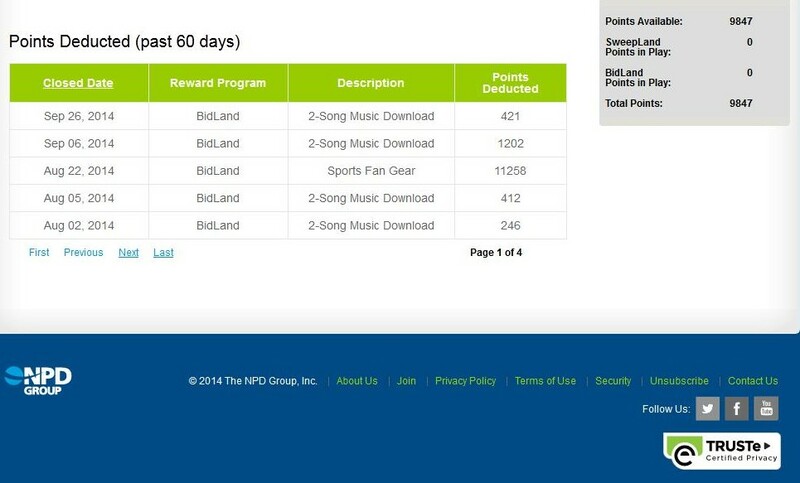 As you can see below, in the 60 days shown I picked 8 song downloads and sports gear (a Chicago Bears hat). These items were won in auctions. As you can see with the song downloads I try to get them for under 300 points but sometimes when you want a new song, you want it now and I have paid way more than that at times. Some of the items offered in the past include ipod shuffles, movie kiosk rentals, restaurant gift certificates, household appliances, bicycles, vacations, phone accessories and much much more. VIP Voice is always updating the site, adding or upgrading a feature here or there. They have run a ‘drive to 5’ promotion where if you complete at least 5 surveys in a month you get thousands of bonus points with no catch. They have a ‘Pigskin Pick ‘Em’ contest where you choose who you think will win NFL games with cash prizes every week for winners. UPDATE: VIP sometimes offers a food diary. You will be asked to record all foods you eat for a one week period. I have done this many times and it takes about two hours total. At the end of the week you will be given bonus points for the site as well as a $25 visa gift card for participation. This is a fun site that is fun to use, simple but yet always keeps getting better to keep interest of members. This site is run by the Toluna Group, a longstanding, well respected market research company. They run a different survey site called Toluna that also offers free product trials. If you take paid surveys online then VIP Voice should be on your list of sites to check out and it just may become one of your favorites too. Register to join VIP Voice here. Find more great survey sites to join and earn income from here. Guaranteed to never be disqualified from surveys at this hot site! We have helped over a thousand people join and use this site, all at no cost. Together they have earned thousands of dollars! We continue to support and recommend this well run company to make more income online. You can be the next one earning with ease, join now! Paidviewpoint is one of the simplest survey sites to use. Their short survey format and easy interface with the member is refreshing and makes for a pleasant experience. Can you make money with Paidviewpoint.com? Yes you can, and you certainly will if you stay active daily. The design and feel of this site is all about transperency and ease of use. Each day you get a Traits survey and get paid for it. When you get a Biz survey, you are shown what each click is worth. You are shown your TraitScore and paid accordingly. What do all these terms mean? Well they are what makes this site unique. TraitScore – Paidviewpoint believes that a long term, reliable and trustworthy member is worth more. And they pay accordingly. Your TraitScore will start out at the bottom. For every Traits survey you fill out the consistency of your answers will be calculated. If you answer questions about yourself consistently over time, you are deemed more and more trustworthy and steady and will be rewarded with a higher TraitScore. Get that score up over 9000 and you have achieved the top 10% of Paidviewpoint members. Your goal will be to get that score up as quickly as you can, to reach the highest level of bonus money for each survey you complete. This is like getting raises as your experience and loyalty and value to the company grows. What a great concept. Traits survey – Each day you will have the opportunity to fill out a Traits survey. You will get paid instantly for these surveys, and they are worth at least $.10 depeding on your TraitScore. As your TraitScore goes up, so does your bonus money from these surveys. As with all surveys on Paidviewpoint a Traits survey will never take more than five minutes to complete. As you go through the questions, you will see at the bottom an estimate of how much longer before you are done. When you are done, your payment details pop up and you get a thank you, as always. This company is very friendly and loves their members to know they are appreciated. Biz survey – These surveys are in addition to your daily Traits surveys and they are where you will make the bulk of your money on this site. When you start a Biz survey, you will notice on the right side a dollar amount. Each time you answer a question and click continue you are getting paid this amount. It can make one want the survey to last longer when it’s so easy and enjoyable and you see the money building up with each quick answer! At the end of the Biz survey you will be shown your earnings with any bonuses added. The amount offered as payment for a Biz survey varies but can be well over $1 for each. You may be invited to one a week or several a day, depending on your demographics and your TraitScore. Those with higher TraitScores will be invited to surveys more often and will get more lucrative surveys than beginners to the site. The longer you are with this site the more opportunities you will have to make money. Paidviewpoint pays by PayPal, Amazon gift card or Walmart gift card. Payments are processed by an actual person, for an extra touch of customer service, and to weed out the people with multiple accounts or those trying to scam the company with robots etc. Your payment should be prompt and free of hiden charges. Paidviewpoint requires a $15 minimum payout. You will need to provide a phone number and valid information, just as with any company you have a working relationship with. Explore more paid survey sites here. Author More Income, Better LifestylePosted on January 20, 2019 January 23, 2019 Categories free income opportunities, survey sitesTags best free survey site, free survey sites, how to qualify for surveys, is paidviewpoint legitimate, make money, surveys disqualify meLeave a comment on Guaranteed to never be disqualified from surveys at this hot site! We are husband and wife, parents of two boys. As residents of Denver CO we enjoy hiking, rockhounding, camping and generally being immersed in nature. Our blogs grow out of an enthusiastic desire to provide our family access to the best this world has to offer. We want this for you and yours as well. Paul is currently an electrician by day. He has been a handyman, author, US Army intelligence analyst, warehouse supervisor, project manager, small business owner, fence builder, printing press operator and more. Marian schools one of our boys at home by day. She teaches do it yourself crafting classes as well. She has been a pizza parlor manager, a licensed insurance agent, a leasing agent, automobile assembler and more. More Income, Better Lifestyle Powered by WordPress.com.